The White Water Gallery is pleased to announce the upcoming presentation of REBEL, a multi-faceted media arts installation featuring two of Canada’s most infamous contemporary artists, Istvan Kantor and Terrance Houle. Kantor and Houle consistently push the boundaries of their art form and continue to spark an abundance of critical commentaries around their art practices. White Water Gallery is bringing them together to ignite similar critical discourse in their local community of North Bay, Ontario. Rebel is a term we use for individuals that push against the tide in defence of their own opinions and concepts. These people create controversy and use unconventional methods to disseminate their ideas. Kantor and Houle are two artists that definitely fit this definition of rebel, though their rebelliousness manifests itself in different ways. Kantor’s work tends to be very aggressive and visceral in terms of the performative gestures he uses to convey his ideas, while Houle’s work, though still aggressive, is more subtle in its attempts to provoke his audience. Both artists, however, are champions at challenging existing structures within modern day society and subsequently find themselves often classified as “trouble makers.” Both artists’ work will be displayed in linked spaces within the gallery, allowing the work to be seen simultaneously and yet independently. This will create a juxtaposition of artistic methodologies while enabling discussions about the connections between them. 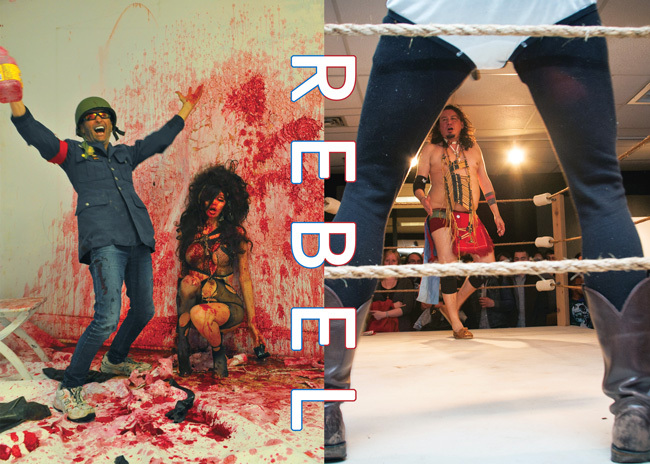 REBEL will be on display from October 4th to November 16th with an opening reception featuring performances by the artists on October 4th starting at 7 pm. This exhibition was made possible through funding from the Canada Council for the Arts’ Media Arts Project Grants Program and the Ontario Arts Council’s Multi and Integrated Arts Projects Program. For more information, please contact Clayton Windatt, Programming Director, at the White Water Gallery by phone at (705) 476-2444 or by e-mail at programming@whitewatergallery.com.